At Thanksgiving time in 2012, our family gathered around more than just a dining room table. We also gathered around an olive grove for our very first harvest of the beautiful Tuscan olive trees planted two and a half years earlier. In Italy there are many festivals in November to celebrate the olive harvest, when family and friends gather to harvest the plump green and purple fruit by hand. On a cold but sunny morning, we started a new Bice family tradition: picking the fruit to make “green gold”—the buttery, peppery, and delicious olive oil. 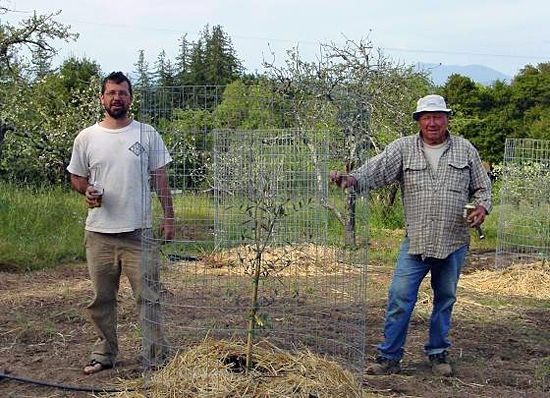 In 2008, we were able to purchase the 10 acre property that bordered Redwood Hill Farm. This new land for us consisted mostly of old neglected apple trees. We went right to work on trying to revitalize the orchard and we enjoy our “annual cider press day” every late summer. We began to spread the goat manure in the orchard certain times of the year and it has done wonders for feeding the apple trees as well as retaining moisture for the organic, dry farmed apples. The extension to our property also gave us space for our solar panel system, which powers 100 percent of the dairy, barns and housing around them; once again continuing our commitment to sustainability. Later in 2009, after touring some of our fabulous local olive oil producers, Jennifer along with our Dad, Kenneth, decided we should dedicate a small piece of the new property to that ancient Mediterranean fruit. During that winter I planned the planting of the new grove, although it was a difficult time for us because our mother Cynthia passed away after a long bout with ovarian cancer. Like the olive trees, Mom was always strong and lived much longer than the doctors first predicted. I am grateful that she was with us to welcome the arrival of our son Colton, who was born six months before she passed away. The staff at Redwood Hill Farm thoughtfully and appropriately gave our family an olive tree as a memorial gift; the olive branch is a symbol of peace, and although we were deeply saddened by the loss of our dear mother, it was a relief to know that after an arduous battle, she is now at peace. The darker days of winter turned into the renewal of Spring, and it was time to plant the young olive trees. Dad, horticulturist and drip irrigation extraordinaire, came up from Arizona to help me with the project. 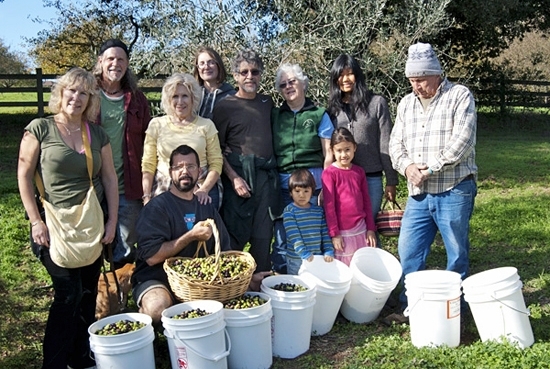 We purchased 35 trees of Tuscan varietal from local oil producer McEvoy Ranch. Mom’s tree is a Frantaio varietal and went in first. We also planted Leccino, Pendolino and Maurino varieties. 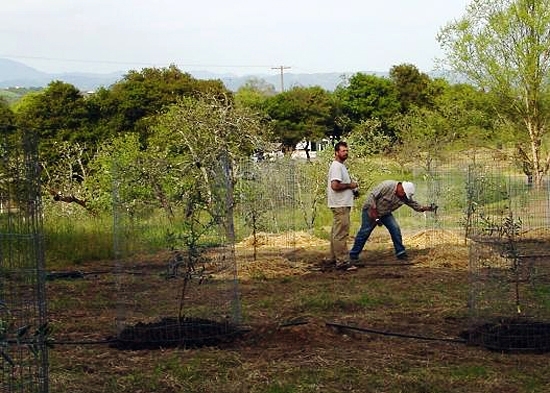 Our orchard is composed of the famed Goldridge soil—a rich, sandy loam ideal for many fruit trees, including olives. This along with our Mediterranean climate, a south easterly sun exposure and ample amounts of composted goat manure, was the perfect recipe for the vigorous growth of the juvenile trees. We pinched off the tiny olive flower buds the first two springs the trees were in the ground so all the energy could go into branch growth. The third spring we allowed the buds to turn into tiny white flowers that would soon be wind pollinated and create the fruit that would lead to our first harvest. It was nice to have harvest time right after Thanksgiving as Dad was here for the holiday and could help with the harvest of the trees he planted two and a half years earlier. The various olive varieties ripen at different times. 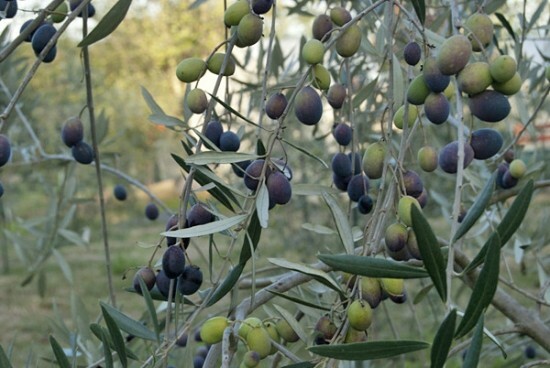 For optimum complexity of the oil, it is best to harvest the olives when you have a good mix of green (not fully ripe) and purple (ripe) fruit. The green fruit will add more “grassy” and “peppery” notes to the oil while the purple fruit will add “floral” and “buttery” notes. Timing of the fruit was perfect as well as the weather, as the sun warmed our bodies while we plucked the fruit. Laughter and the pleasant conversation of three generations of our family could be heard as we moved down the rows. The plump fruit were gathered into buckets that later would be brought to a community press where it would be crushed into the pungent, fresh green oil. We had a contest to guess the total weight of what we picked and sister Sharon won, being only one pound off of the 160 pound total! Not bad at all for such young trees. We will enjoy this maiden harvest of oil with our favorite crusty bread, atop salads made of farm grown greens, and with classic goat milk feta cheeses. 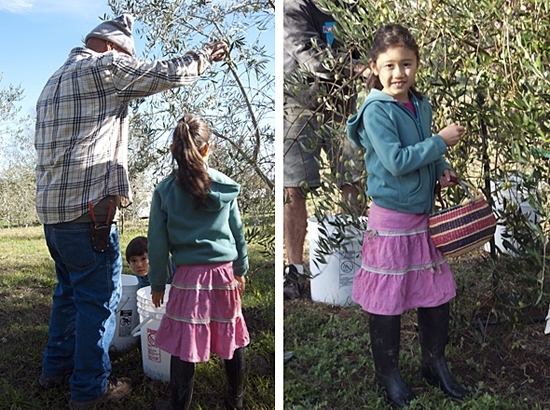 There is an old Italian saying that “You plant an olive orchard for your grand children”. This came about due to the slow growth of trees and the many years it takes for them to reach full production. It may be true that yields will be small for now, but being seeing my children out with their Granddad, as well as there Aunties and Uncles on a beautiful morning on our special farm, makes me so thankful for all we have now.